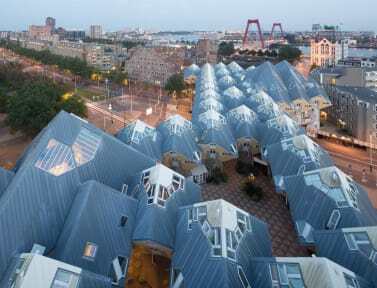 Located in the world renowned Cube Houses, a night at Stayokay Rotterdam is an experience in itself. With it's hip hostel bar and central location in Rotterdam it is the perfect hostel to stay for your city trip. With your lunch package, which you bought in the hostel, you are ready to explore Rotterdam. Have a stroll (or ride a bike like a real Dutchman) through the city center by day to see all the sites that are only a stones throw away. Afterwards freshen up and have a nice drink at the Hostel so you will be ready to go out in the evening for some clubbing or a cozy Dutch terrace or cafe. Sit down, relax and enjoy your drinks and meal in the modern but cosy bar that looks out over the quiet 'Oude Haven' (17th century harbour) on the one, and the busy city centre on the other side. - that any group bookings of 10 people or more must be made directly with the hostel. I changed my trip plans to come to the cube houses in Rotterdam, and let me tell you, it's the best thing I've done this trip. The hostel is right next to the Blaak station, and the markthal, and it is very comfortable. I extended my stay an extra night everything was so perfect. Great vibe, nice bar, huge free breakfast, and the staff are super nice. The city itself is not huge, so I wouldn't recommend staying too long, but if you do stay at all, this is the place to go. 11/10. great location, located inside the Cube Houses and near Rotterdam Blaak station. The dorm rooms are clean and comfortable. The breakfast is average with not a lot of choices. They accept large group bookings (school kids) which may be noisy at night. Stayed here for the Rotterdam Marathon 2019. It was a 10 min walk to the start and a 10 min walk from the finish (absolutely PERFECT location for the race)! I stayed in a 7 person female dorm and was happy with the size. Only bad thing was that there was only 3 lockers for 7 beds. Everything was clean and the bed was comfy. Great value for the location. Cool architecture. Plenty of causal and restaurant dining nearby. it's more of a quiet nights sleep, not really a place to meet people and party. This is a fun hostel in a great location! It's very convenient to tourist attractions and the Rotterdam Blaak station. In the lobby they have all sorts of discount cards (10% off Euromast, etc), though I didn't use these because my stay was rather short. They have a large selection of food at the included breakfast. The shower and bathroom were located in my dorm room; not always the case at hostels. You'll need to bring your own lock if you want to seal a locker in a dorm room. Amazing architecture, and such a cool building to stay in. Close to the market, and about 15minute walk to all the bars. Awesomene unique hostel! The dorm had heating issues, with the heater not functioning. The staff hid some of his personal guests in my dorm for a night which was unfair and unsafe. Breakfast was also less variety and bread was not fresh. Don’t stay here. Such a terrible place avoid. No lockers in rooms if you want a locker you have to pay. No shower curtain in ensuite so everything gets wet. Toilet smelled up the whole room even when not used all day. Zero atmosphere. There is so much street noise you won't get any sleep.